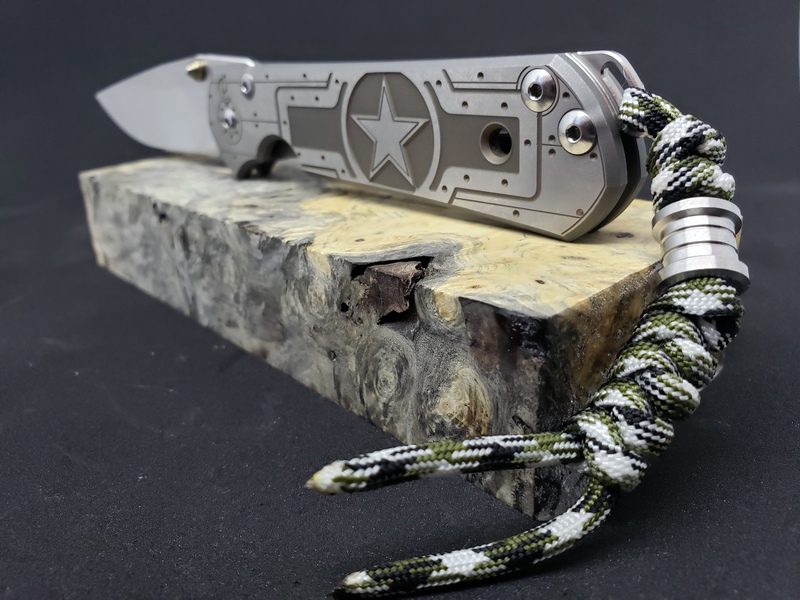 Discussion in 'Chris Reeve Knives' started by sfknifeguy, Apr 5, 2019. Just received my very first CRK yesterday. I got an Umnumzaan in a trade and I'm really enjoying it. I am not much a lanyard guy, so when I removed it, there was simply no color flair left to the knife. I am new in the CRK world, so forgive me if this has already been a posted question. Where could I find anodized hardware (probably just blue) as well as backspacer for this little guy? Honestly any custom hardware for this thing would be awesome. 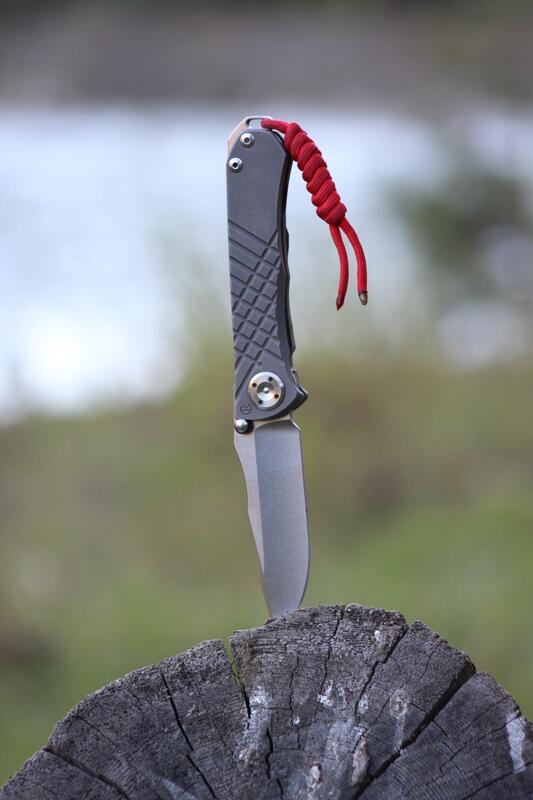 I also saw Millet was taking pre-orders on timascus clips so I may need to get in on that. Thank you! I appreciate you pointing me in that direction! That first one with the star design is gorgeous, the lanyard is as well, and the second one looks neat with that different pivot screw/pin. I am not much of a lanyard guy however, do you know where I might find custom ti hardware for them? The "star" design is called "Tanked"- Underrated IMHO..and discontinued. The hardware in both of those knives are ones that I make..Large Seb, small seb and Umnumzaan. Outside of that..there are a few people that make clips (ripps garage tech), Millit..And a few others.. Most don't sell on BF..Some on IG,..some on facebook. @TTTis has some backspacers here.. @BOOMER52 is another avenue. Depends on your tastes. I can't link to some of them as they don't have proper memberships to advertise here. Thanks so much for all of this info! I will be pm'ing you momentarily! By the way, that star design is gorgeous for sure. MXG Gear has aa solid anodized lanyard pin in blue or bronze. Thanks man this is a great info. I really wish I could get a matching backspacer standoff too in addition. I have tossed around the idea of anodizing the scales myself and then polishing the flats, but I feel as if that might void warranty and therefore it would be ineligible for spa treatment, perhaps I'd have to reach out to them directly to find out. The reason I didn't post links is because it is verboten to post links to dealers on BF that do not have a membership. Please remove the links. Sorry. Link removed for MXG Gear. Should the CRK link be removed as well? I measured and the Sebenza backspacer is just slightly thinner (0.39).than the Umnumzaan (0.42), though the hole is the same diameter. CRK is fine- They have a subforum here. Off topic but does anyone know when CRK started adding the grease and Allen wrenches with the Umnumzaan’s? I am getting one in trade with the old cardboard box made in October of 2012 and the guy said it didn’t come with grease or the Allen wrenches. And would CRK send me a set of the wrenches for free or would I have to purchase them?